Barnet Council got a new Mayor this week. 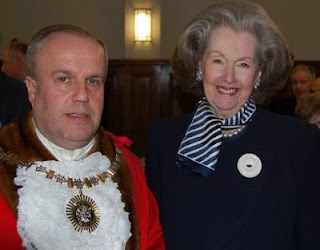 Councillor Brian Coleman, one of Londons best known and most popular politicians took over from outgoing Mayor John Marshall at a Mayormaking Ceremony on Tuesday at the recently refurbished Hendon Town Hall. The New Deputy Mayor is Councillor Hugh Rayner. For the full details Click here for Londons best Read. Well don't Raine and Mayor Marmite look a wonderful couple? Statler and Waldorf cannot think of a better suited pair than "King of Bling" Window Twanky Coleman and his Mayoress Raine "Unspeakably vulgar" Spencer. Statler and Waldorf will be buying Hello! magazine this week in case there are photos.